This quick and easy recipe for dairy free coconut milk baileys is a real crowd pleaser. If you have time then the coconut chocolate shot glasses are well worth making as they actually work as shot glasses (believe me this is rare in recipes) and taste delicious. Suitable for vegan, plant-based, refined sugar-free and dairy-free diets. We’re a healthy living website so I don’t often drink alcohol but a small amount now and then is fine in my books. The people that live longest in this world do often seem to consume a small amount of alcohol occasionally. If you don’t drink it all you can just leave out the alcohol. It’s a great drink for drinkers and non-drinkers as you can mix the alcohol in later after blending and make two different versions – an alcoholic and non-alcoholic. Place all of the baileys ingredients into a small blender and blend until all mixed. Melt the creamed coconut block in a double boiler. Mix the sweetener and cocoa powder with the melted creamed coconut. Spoon the chocolate mixture into shot moulds, make sure it goes right to the bottom and there are no big air pockets. Give it a hard thump on a flat surface and poke with a fork to make sure there are no air pockets. Place in the freezer for at least an hour. Remove from moulds and serve. I make this with full-fat coconut milk, you can use low fat if you prefer but it will be less creamy. The mixed baileys will last about 5 days in the fridge and the shot glasses will last months stored in the freezer. If you don’t have espresso just replace with strong coffee. 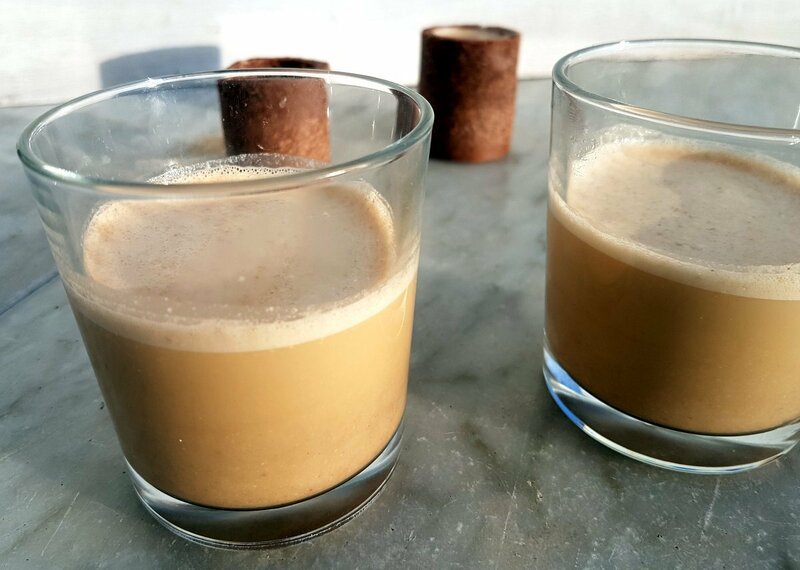 In this recipe I use creamed coconut to make the shot glasses – the kind of coconut that comes in a solid block. It allows you to make a shot glass that will not melt easily. You could use normal chocolate but this will get very messy very quickly. By making your own dairy free chocolate you can make it cocoa rich and firm. It will also be high in flavonoids and you can use your favourite sweetener. They look different to solid chocolate with the flakes of coconut but they taste great and all that coconut fibre helps make them sturdy. Don’t worry if some of the chocolate mixtures does’nt make it right to the end of the shot glasses you can just even off the top with a knife to make it straight and be able to hold the coconut baileys. I might have had to do this with my first attempt. Hi. Does Baileys have coffee in it? More to the point, do you have any suggestions for a caffeine-free version, ‘cos I haven’t done that stuff for years?